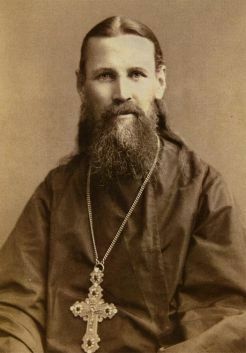 The Wonder-Working Father John Sergiev is another of the great elders and saints who were a part of the spiritual revival started by St. Paisius Velichkovsky. Widely venerated as a saint even during his lifetime, and the only married parish priest in the Russian calendar of saints, Father John is known for his spiritual gifts of powerful prayer, healing, spiritual insight and great love for all people. He also reawakened the Russian Orthodox Church to the Apostolic tradition of receiving Holy Communion at every Divine Liturgy. 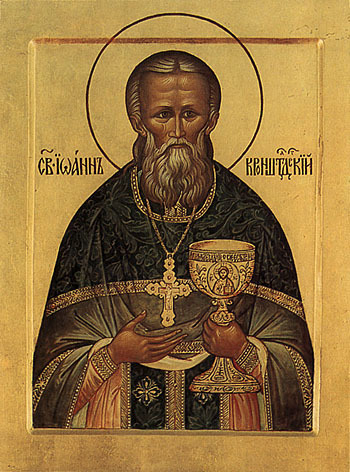 This is why he is most commonly portrayed holding a Communion chalice, as he is in the Russian icon to the right. Born to poor, devout parents in a small village in the far north of Russia, Father John experienced the power of prayer even as a child. 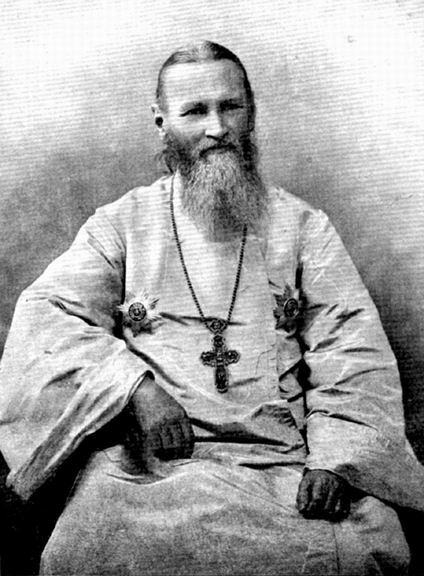 While at the Theological Academy in St. Petersburg, he wanted to be a missionary monk to Siberia, but after a vision, he realized that God wanted him to be a missionary where he was. Thus he married and was ordained priest in 1855. 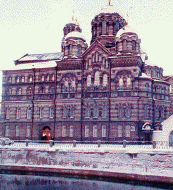 He was assigned to the St. Andrew Cathedral on the Island of Kronstadt, in the bay near St. Petersburg. Kronstadt was filled with unspeakable squalor and misery, disease and starvation, crime and alcoholism. However, Father John remained there for 53 years as an urban missionary, putting into action Christ's command to love our neighbor, healing people's bodies and souls, and teaching children, whom he especially loved. As his reputation as a healer and miracle-worker spread, the many requests for his help that flowed in were accompanied by much money, which he used for extensive charitable works, including buildings a "House of Industry" that provided jobs, job-training, food, shelter and medical care for the poor. Father John managed to perfect his holiness, not in a peaceful, remote monastery, but in a large, noisy, dirty, stressful, crime-ridden city, always surrounded by crowds of people everywhere, with little time to himself. He received his strength from the overwhelming awareness of the Presence of God, from reading the Bible, and from daily serving the Divine Liturgy and receiving Holy Communion. Every day his cathedral was packed with 5,000 people for Matins and Liturgy: it lasted from 4 am until noon, because he insisted that everyone present receive Holy Communion, and because there were so many requests for his prayers. After Liturgy, he healed and prayed for those who asked his help, treating rich and poor equally, and rarely returned home before midnight. Despite his demanding schedule, he managed to maintain a spiritual diary of simple and practical Bible-based meditations, published as My Life in Christ. He teaches that the weapons in spiritual warfare are the traditional Orthodox armor: prayer, repentance, fasting, reading the Bible, and at least weekly Confession and Holy Communion. Father John was a simple parish priest, who was endowed with an absolute faith in the power of prayer, a power that he used daily, and continues to use, to help people who request his aid. Although venerated as a saint since before his repose in 1908, he was officially glorified/ canonized in 1988. 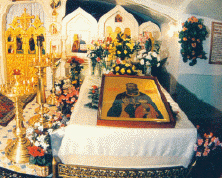 St. John's relics (above left) are located in the crypt of the St. John of Rila Women's Monastery, which he founded in northeastern St. Petersburg (above right). Today, as even throughout the Communist era, flowers were regularly placed outside, by the street, on the window ledge closest to his burial site in the crypt on the other side of the wall.